Long before there was a Black Lives Matter movement in places like Cleveland, Ferguson, St. Paul Baton Rouge and Baltimore, there were black student activists in the tourist town of St. Augustine, Florida. 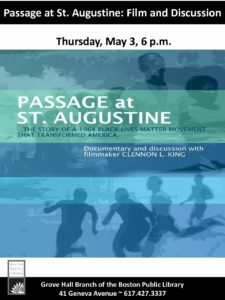 Please join us on Thursday May 3rd at 6 p.m. for a screening of Passage at St. Augustine. This film, by local filmmaker Clennon L. King, tells the story of one of the bloodiest chapters in the Civil Rights struggle that led to the passage of the Civil Rights Act of 1964. A discussion with the filmmaker will follow the film. We look forward to seeing you there!